We know you’ve seen those sleek parametric designs that are all the rage in cutting-edge architecture, but have you ever wanted to make your own? Venturing into the software zoo of Grasshopper and Rhino can be daunting on your own, and understanding algorithms and computational geometry can sound like Greek to the uninitiated. Luckily, parametric expert Ronnie Parsons of Mode Collective has joined the upcoming facades+PERFORMANCE Conference taking place in New York City next week, April 11 and 12, and will help guide beginners into the exciting world of Parametric Design. With a focus on fundamental concepts and workflows for creating performance-based design models with the parametric design tool Grasshopper for Rhino3D. 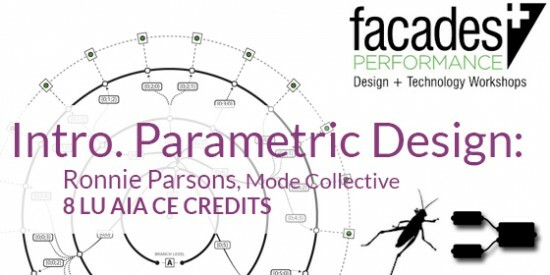 Parsons’ Technical Workshop, Introduction to Parametric Design, will guide participants through a series of exercises designed to emphasize the relevant applications of parametric design for professional practice. Register today for the Introduction to Parametric Design workshop and the facades+PERFORMANCE before space fills up. There are 8 LU AIA CE credits up for grabs, so head on over to the facades+PERFORMANCE homepage for more information.